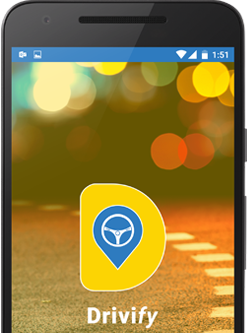 Hire a driver from your smartphone in 3 simple steps! Get the Drivify app on your mobile now! Enter your mobile number to get the driver services at your doorstep. Pay for what you use with cashless payment solutions. Enter destination address to search for the nearest driver. Your pick up location and vehicle type is auto picked up. Can be changed manually if required. 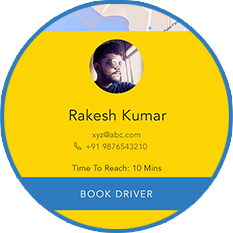 Book your driver, track him on his way to the pick-up location & get notified on arrival. Get in to the most comfortable seat in your car as we drive you there. Our app informs you of traffic and the route map to your destination. At the end of your ride, proceed to make a cashless payment using your Citruspay Wallet or your Credit Card. Pay for what you use with cashless payments. 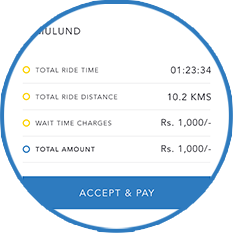 ₹ 299 (base charge) for the first 75 minutes starting from the driver arrival time. ₹ 25 for every 15 minutes of driver usage time after first 75 minutes. ₹ 399 (base charge) for the first 75 minutes starting from the driver arrival time. ₹ 40 for every 15 minutes of driver usage time after first 75 minutes. Cancelled after Driver Arrival – Base Charge. ₹ 100 Discount - First booking on Drivify app. Here's what Drivify offers to help the car owners from time to time. Drivers verified by a leading background verification agency. Driver's GPS aided device guides him to you. No need for multiple phone calls and verbal route guidance. Billing in line with usage. Base cost includes 75 minutes usage. 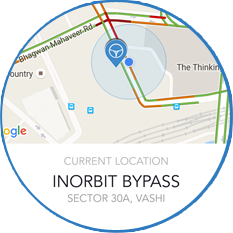 We used your driver earlier this evening for a drive from Lower Parel to Chembur. I was absolutely delighted with the way your app processed my booking with just a couple of clicks and an instant confirmation. Your driver, Pratap was here in 30 minutes. Compared to the drivers that we've used in the past, I think Pratap was very well groomed & courteous. It was a smooth journey all the way, starting from the Driver arriving earlier than the stated time, following all the traffic rules and staying within comfortable speeds. This finally solves my driver problems and hope that Drivify maintains these service levels. This app is really kickass! What a smooth transaction it was… Like the fact that it took me less than 30 seconds to book a driver and know who would be driving me… And I could see track him on his way to where I was. I was surprised to know he was waiting next to my car when I called him. You guys must be training them very well… As for the driver, he was what I was told to expect by your team. Well groomed, courteous and experienced in operating my XUV 500. And thank you for accepting credit card payments. Team Drivify – Keep it up! Marshal is probably one of the best drivers I've come across recently. He made me feel like a VIP… I was tempted to hire him permanently… Great service, economical and good mobile app. Feroz did very well to get me back home safely and on time. I must complement his knowledge of roads and alternate routes. Your drivers are your brand ambassadors and they are doing quite well. I quite like the experience of booking over your mobile app. And nice to know that Feroz knew what car he was to drive. Smart move there Drivify! UI and UX design will be one of our key differentiators. Drivify wants to keep improving on this so that our user experience continues to be best in class. If selected, you get to be part of a small team which decides the complete user experience of the website and our mobile application. We are looking for someone who likes to keep researching the latest trends, designs and implement them in his/her work. Experiment with colors, effects, patterns, typography, icons etc. Looks at a problem and solves it in a unique and special way. Quickly builds software and find interesting ways to hack together code. Is a full stack generalist who knows many languages and is good at a few. Just loves to code, code and code. Has 3-5 years of relevantwork experience. 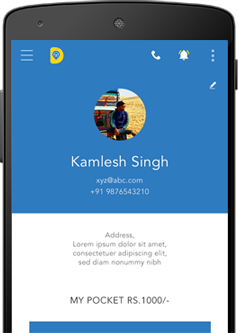 Hands on experience with Hybrid development kit like Ionic, PhoneGap, Cordova etc. Are you in a permanent relationship with cars? Do you want to be in a temporary & inexpensive relationship with drivers? Think of Drivify. The safe & smart solution for your on-demand driver requirements. Incepted as DR Mobility Solutions Pvt. Ltd., Drivify offers a simple and an economical solution for every car owner’s on-demand driver requirements. Our Services can be booked over a phone call or using the Drivify mobile app. We've identified the city's best drivers and got the best trainers to upskill them. These drivers are available to you on-demand at the tap of an app. They reach you within an hour and you pay them only for what you use. So, "Why Drive, when you can Drivify!" Our Enterprise Solutions team works with several businesses in the automobile industry. We manage critical processes for some of the large brands in this space that ultimately result in cost and resource optimization for our clients along with a better customer experience. There are those who plan in life, and then there are those who execute as well. Good relationships can sail you safely in any water. Experience, expertise and conviction is a rare combination. A brand is no longer what we tell the consumer it is - it is what consumers tell each other it is. There are those who plan in life. And then, there are those who execute as well. Prasad belongs to the latter category. Having managed large teams over the last 15 yrs. in organizations like Thomas Cook, Jet Airways, Kuoni & Zenta, he's known for his perseverance and ability to get things done. He quit his job of 6 yrs. at Thomas Cook as a Vice President to pursue his entrepreneurial passion. He is the thinker, the actor and the driver. Jatin is a people's person. He knows that a bridge once built is not supposed to be burnt. 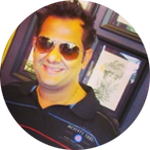 He has over 12 years of combined professional & entrepreneurial experience. While his core competency has always been HR and is known for driving large-scale talent acquisitions, at Drivify he is bringing all his might to the fore. 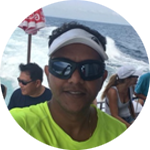 Pankaj has swum with the sharks and dealt with the best of the brains in his 16+ years of professional experience. An entrepreneur and startup specialist, he has successfully managed 3 startups in the last 7 years. 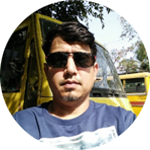 He has run e-commerce operations for Jet Airways, and also independently consults Leela Hotels, Jet Airways and Jet Privilege.Pankaj plays the important role of nurturing Drivify technology and offering vital infrastructural support. A marketing maverickwith specialisation in Travel, Manoj over the last 20 years has held leadership positions for leading travel brands like Kuoni, Thomas Cook and he currently heads the India marketing team of Flight Shop.Manoj'svaluable counsel has helped shape Drivify to its current form and continues to play a key role in taking it to the next level. 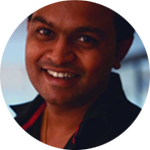 Jitendra serves as the Managing Director & Founder of Citrus Payment Solutions. With over 11 years of experience in financial services, he has grown to become an expert in the payment industry. 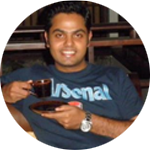 Keen to transform the payment space, Jitendra is a leader with an excellent record of accomplishments & execution. Having been there & done it all, he's the de facto go-to man for team Drivify. We encourage you to share your ideas and suggestions with us. You may use the below form to write to us. DR Mobility Solutions Pvt Ltd.
Drivify,12/93, First Floor, Unnat Nagar 3, M G Road , Goregaon(w), Mumbai 400062. Our Drivify app for iOS is currently under development. We'll formally communicate once it's available for download. DR Mobility: shall mean DR Mobility Solutions Private Limited, a company incorporated under the Companies Act, 1956 under the CIN No. U63090MH2015PTC264269 and having its registered office at B/24, Nand-Dham, B.P. Marg, Dahisar (W), Mumbai 400 068, Maharashtra, India. Application: shall mean 'Drivify' the mobile / digital device application. DR Mobility is the registered owner of this Application called ‘Drivify'. Website: shall mean www.drivify.in. 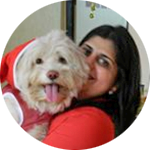 DR Mobility is the registered owner of this website called www.drivify.in. Drivify / Trademark : shall mean the trademark named Drivify that is owned and registered by DR Mobility. No other person shall be entitled to use and represent the same without prior written permission. You / User: The term 'you' / ‘user' refers to the natural or legal person using or viewing the Website and / or Application. Services Description: DR Mobility through the website, its call center and the Application is providing you the platform, for easy and most convenient access to private drivers, for short or long trips, intra city or out of city trips, however only for temporary purpose. The Service is basically designed to offer you information and a means of obtaining short-term private driver solutions to coordinate point-to-point and round trip private driver services, at your request. As a User, you authorize the Driver assigned to you over the Website and / or Call Center and / or Application to operate your vehicle and make decisions on your behalf during a period of time designated by you. DR Mobility itself does not provide transportation services. It is up to the Driver to offer transportation. DR Mobility only acts as intermediary between the Driver and User. The provision of services by the Driver to User is therefore subject to the contract between the Driver and User. DR Mobility shall under no circumstance be a party to such contract. It is expressly made clear to User hereby that DR Mobility does not directly or indirectly employ any Drivers. DR Mobility disclaims any and all liability in respect of the Drivers including but not limited to any claims of employment or any vicarious liability arising out of the Service or otherwise. · After registering your vehicle and your personal accurate and complete information, the Application and / or Website allows you to send a request of Service to a Driver. The GPS receiver, which should be installed on the mobile device (smart phone)/ computer on which you have downloaded the Application or the Website, shall detect your location and shall send your location information to the relevant Driver in the vicinity of 0-10 kms. DR Mobility reserves the right to revise /change this process as par its business requirement without any prior notification. 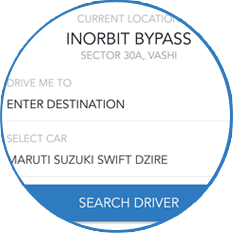 · Driver can also be assigned to you by contacting its Call Center. · At this juncture, DR Mobility has sole and complete discretion to accept or reject each request for providing the Service. DR Mobility also has sole and complete discretion over whether to use the Application / Website/ Call Center to receive the leads generated through the Application / Website/ Call Center. · If the driver accepts a request, the Application / Website / Call Center personnel notifies you and provides information regarding the Driver within the vicinity of 10 kms for your registered vehicle. · Upon acceptance of request by a Driver, you shall receive details of the Driver that includes his name, contact details and passport size photograph of the Driver. The Application also allows you to view the Driver's progress towards the pick-up point, in real time. This is dependant on data connectivity of consumer and driver mobile device on which the application is installed. · User shall pay fees after completion of usage of Services of DR Mobility and Driver (as displayed on Website / Application/ Call Center) or as agreed to in the Application Terms as listed on the Application / Website including parking additional night surcharge (where applicable), one way trips, toll charges, repairing and any other charges / cost incurred thereof and / or any fee or levy presently payable or hereinafter imposed by the law or required to be paid for availing of the Services. · User is required to fill in a Performance Evaluation rating evaluating the driver & his service after completion of Services Performance evaluation rating. · You can enter into legally binding contract under Indian Contract Act, 1872 only then you will be eligible to become a registered member of the Website and / or Application. Persons who are "incompetent to contract" within the meaning of the Indian Contract Act, 1872 including minors, un-discharged insolvents etc. are not eligible to use the Website. If you are a minor i.e. under the age of 18 years, you shall not register as a User of the Website and / or Application and shall not transact on or use the Website and / or Application. As a minor if you wish to use or transact on Website and / or Application, such use or transaction may be made by your legal guardian or parents on the Website and / or Application. DR Mobility reserves the right to terminate your membership and / or refuse to provide you with access to the Website and / or Application and/ or refuse service, if it is brought to DR Mobility's notice or if it is discovered that you are under the age of 18 years. · That at all time, you have the legal right and authority to possess and operate the vehicle registered with DR Mobility and further to handover the same to the Driver for the desired trip. · The vehicle registered with DR Mobility is in good operating condition and meets the safety standards and all applicable statutory and state and central departments of motor vehicle requirements for a vehicle of its kind. · You are agreeing to share your vehicles information, car insurance information and your personal accurate and complete information as required by DR Mobility and the same shall be stored with DR Mobility that is acceptable to you. · You have not shared any information that is false, inaccurate and incomplete. · You shall be solely liable, responsible and accountable for any and all alleged / claimed loss, damages and injuries of any nature as a result of the condition of your vehicle or otherwise, including, but not limited to the personal injuries, death and vehicle / property damages. · You will be solely responsible for the full functionality of your vehicle. If your vehicle fails to function (electrical, mechanical or other) in any way, DR Mobility / Driver in possession of your vehicle will not be responsible for the same. · You have procured all the necessary Insurance policy, in respect to the Vehicle and yourself at all times and the same are valid and subsisting at the time of availing the services. · In specific you have a valid policy of liability insurance (in coverage amounts consistent with all applicable legal requirements) for the operation of your vehicle to cover any anticipated losses related to your participation in the Services or the operation of your vehicle by Driver. You will be solely responsible for any and all liability which results from or is alleged as a result of your operation of the vehicle and you choose to participate in the Services, including, but not limited to personal injuries, death and property damages. In the event of a motor vehicle accident you will be solely responsible for compliance with any applicable statutory or department of motor vehicles requirements and for all necessary contracts with your insurance carrier. · You shall obey all local laws related to the matters set forth herein, and will be solely responsible for any violations of such local laws. · You agree that DR Mobility has the sole authority to accept / reject to provide Services to you. · You agree and accept that the use of the Services provided by DR Mobility is at your sole risk, and further acknowledges that DR Mobility disclaims all representations and warranties of any kind, whether express or implied. All Services are provided on "AS IS" basis. · You specifically authorize DR Mobility to use, store or otherwise process your 'Sensitive personal data or information' [as such term is defined in Information Technology (Reasonable security practices and procedures and sensitive personal data or information) Rules, 2011] in order to provide the Services to you. Subject to applicable law all information provided to DR Mobility by you shall be deemed to be DR Mobility's information to use as desire. · You agree that reaching the requested service destination within time limit shall be your responsibility (for example If you miss any train or flight or bus or reach destination late), DR Mobility will not be liable or responsible for the same and shall not be liable for any loss, damage or compensation thereof. When you use the Website and / or Application or send emails or other data, information or communication to us, you agree and understand that you are communicating with us through electronic records and you consent to receive communications via electronic records from us periodically and as and when required. We may communicate with you by email or by such other mode of communication, electronic or otherwise. · DR Mobility undertake commercially reasonable efforts to bring you into contact with a Driver in order to avail the services of Driver, subject to the availability of Drivers in or around your vicinity at the moment of your request for the Services. (d) if the driver is asked to provide service on a vehicle that is not registered at the time of booking the service. · DR Mobility presents to the User that information on this Website / Application or by its call center personnel is provided "AS IS" with no guarantee of completeness, accuracy, timeliness or of the results obtained from the use of this information, and without warranty of any kind, express or implied, including, but not limited to warranties of performance, merchantability and fitness for a particular purpose. Nothing herein shall to any extent substitute for the independent investigations and the sound technical and business judgment of the Users. In no event shall DR Mobility be liable for any direct, indirect, incidental, punitive, or consequential damages of any kind whatsoever with respect to the Service. Users of this site must hereby acknowledge that any reliance upon any content shall be at their sole risk. · DR Mobility presents to the User that they are not liable / responsible for any conduct of the Drivers. However, DR Mobility encourages User to notify them of any complaints that may have against any Driver or the Services. · DR Mobility does not make any representation or Warranty as to authenticity of the Drivers chosen by Users for their services. DR Mobility does not implicitly or explicitly support or endorse the services provided by the Driver through the Website and / or Application. DR Mobility accepts no liability for any errors or omissions, whether on behalf of itself or by the Driver or any third party/ies. · DR Mobility is not responsible for any non-performance or breach of any contract entered into between Users and Drivers. DR Mobility cannot and does not guarantee that the concerned Users and / or Drivers will perform any transaction concluded on the Website and / or Application/ or our call center. DR Mobility shall not and is not required to mediate or resolve any dispute or disagreement between Users and Drivers. · DR Mobility does not make any representations or warranty/ies, in respect Of the Drivers and of any of its Users. You may independently verify the bona fides of any particular Driver that you choose to deal with on the Website and / Application and use your best judgment in that behalf. · DR Mobility does not at any point of time during any transaction between User and Driver on the Website and / or Application come into or take possession of any of the products or services offered by Driver nor does it at any point gain title to or have any rights or claims over the services offered by Driver to User. · The Website and / or Application is only a platform to connect the User/s to the Drivers. DR Mobility is only providing a platform for communication and it is agreed that the contract for services shall be a strictly bipartite contract between the User and the Driver. · At no time shall DR Mobility hold any right, title or interest over the services provided by the Driver nor shall DR Mobility have any obligations or liabilities in respect of such contract. · DR Mobility is not responsible for unsatisfactory, cancelled or delayed performance of the services of the Driver and for any kind of damages resulted thereof. · DR Mobility shall not be responsible for any of it's unsatisfactory/ deficient services and/or any inability to fulfill it's commitments / assurances, through, it's website / application or otherwise and further shall not be responsible for any kind of damages resulted thereof. Disclaimer: Pricing on any service(s) as is reflected on the Website and / or Application may due to some technical issue, typographical error or service information published by DR Mobility may be incorrectly reflected and in such an event DR Mobility may cancel your such request for the service (s). Membership on the Website and / or Application is so far free for User and / or Driver. DR Mobility does not charge any fee for browsing and using services on the Website and / or Application. DR Mobility reserves right to levy fees on the Website / application. The fees / charges towards providing the services as defined above and Driver fees shall be time to time posted on the Website and / or Application, which shall be subject to applicable taxes including Service Taxes etc. DR Mobility reserves the right to change its Fee Policy from time to time. In particular, DR Mobility may at its sole discretion introduce new services and modify some or all of the existing services offered on the Website and / or Application. In such an event DR Mobility reserves the right to introduce fees for the new services offered or amend / introduce fees for existing services, as the case may be. Changes to the Fee Policy shall be posted on the Website and / or Application and such changes shall automatically become effective immediately after they are posted on the Website and / or Application. Unless otherwise stated, all fees shall be quoted in Indian Rupees. You shall be solely responsible for compliance of all applicable laws including, for making payments to DR Mobility. You may cancel the booking within 5 minutes from the time of receiving details of the Driver after booking for a Driver, without any cancellation charges for all Services. Starting the aforesaid period of 5 minutes from the time of receiving details of the Driver after booking for a Driver, the cancellation charges shall be as per table below. The cancellation charges shall be deducted from your wallet or charged to the account that DR Mobility has been authorized to at the time of registration/ booking of service. The cancellation fees and the stages thereof are subject to change/ modification by DR Mobility from time to time, user is advised to check applicable fees/ penalties before requesting for services. 2. You shall not use any "deep-link", "page-scrape", "robot", "spider" or other automatic device, program, algorithm or methodology, or any similar or equivalent manual process, to access, acquire, copy or monitor any portion of the Website and / or Application or any Content, or in any way reproduce or circumvent the navigational structure or presentation of the Website and / or Application or any Content, to obtain or attempt to obtain any materials, documents or information through any means not purposely made available through the Website and / or Application. We reserve our right to bar any such activity. 3. You shall not attempt to gain unauthorized access to any portion or feature of the Website and / or Application, or any other systems or networks connected to the Website and / or Application or to any server, computer, network, or to any of the services offered on or through the Website and / or Application, by hacking, password "mining" or any other illegitimate means. 4. You shall not probe, scan or test the vulnerability of the Website and / or Application or any network connected to the Website and / or Application nor breach the security or authentication measures on the Website and / or Application or any network connected to the Website and / or Application. you may not reverse look-up, trace or seek to trace any information on any other User of or visitor to Website and / or Application, or any other customer, including any account on the Website and / or Application not owned by you, to its source, or exploit the Website and / or Application or any service or information made available or offered by or through the Website and / or Application, in any way where the purpose is to reveal any information, including but not limited to personal identification or information, other than your own information, as provided for by the Website and / or Application. 5. You shall not make any negative, denigrating or defamatory statement(s) or comment(s) about us or the brand name or domain name used by us including the terms DRMOBILITY, DRMOBILITI, Drivify.com, or otherwise engage in any conduct or action that might tarnish the image or reputation, of DR Mobility and / or Drivify or Users / Driver on platform or otherwise tarnish or dilute any DR Mobility 's trade or service marks, trade name and/or goodwill associated with such trade or service marks, trade name as may be owned or used by us. You agree that you will not take any action that imposes an unreasonable or disproportionately large load on the infrastructure of the Website and / or Application or DR Mobility's systems or networks, or any systems or networks connected to DR Mobility. 6. You agree not to use any device, software or routine to interfere or attempt to interfere with the proper working of the Website and / or Application or any transaction being conducted on the Website and / or Application, or with any other person's use of the Website and / or Application. 7. You may not forge headers or otherwise manipulate identifiers in order to disguise the origin of any message or transmittal you send to us on or through the Website and / or Application or any service offered on or through the Website and / or Application. You may not pretend that you are, or that you represent, someone else, or impersonate any other individual or entity. 9. You shall at all times ensure full compliance with the applicable provisions of the Information Technology Act, 2000 and rules thereunder as applicable and as amended from time to time and also all applicable laws, rules and regulations prevalent within the territories of India (including, but not limited to Service Tax, Sales Tax/VAT, Income Tax, Local Levies) regarding your use of our service. You shall not engage in any transaction in an item or service, which is prohibited by the provisions of any applicable law including exchange control laws or regulations for the time being in force. 14. your correspondence or business dealings with, or participation in promotions of, advertisers found on or through the Website and / or Application, including payment and delivery of related products or services, and any other terms, conditions, warranties or representations associated with such dealings, are solely between you and such advertiser. We shall not be responsible or liable for any loss or damage of any sort incurred as the result of any such dealings or as the result of the presence of such advertisers on the Website and / or Application. 15. It is possible that other user (including unauthorized users or "hackers") may post or transmit offensive or obscene materials on the Website and / or Application and that you may be involuntarily exposed to such offensive and obscene materials. It also is possible for others to obtain personal information about you due to your use of the Website and / or Application, and that the recipient may use such information to harass or injure you. We does not approve of such unauthorized uses, but by using the Website and / or Application you acknowledge and agree that We are not responsible for the use of any personal information that you publicly disclose or share with others on the Website and / or Application. Please carefully select the type of information that you publicly disclose or share with others on the Website and / or Application. 16. DR Mobility shall have all the rights to take necessary action and claim damages that may occur due to your involvement/participation in any way on your own or through group/s of people, intentionally or unintentionally in DoS/DDoS (Distributed Denial of Services). 2. You may use information on the services made available on the Website and / or Application for downloading, provided that you (1) do not remove any proprietary notice language in all copies of such documents, (2) use such information only for your personal, non-commercial informational purpose and do not copy or post such information on any networked computer or broadcast it in any media, (3) make no modifications to any such information, and (4) do not make any additional representations or warranties relating to such documents. 2. We may share personal information with our other corporate entities and affiliates. These entities and affiliates may market to you as a result of such sharing unless you explicitly opt-out. 3. We may disclose personal information to third parties. This disclosure may be required for us to provide you access to our Services, to comply with our legal obligations, to enforce our User Agreement, to facilitate our marketing and advertising activities, or to prevent, detect, mitigate, and investigate fraudulent or illegal activities related to our Services. 6. We are required to and we will share your information with drivers designated / assigned to offer service to you. • The information on this Website and / or Application is complete, true, accurate or non-misleading. 2. DR Mobility will not be liable to you in any way or in relation to the Contents of, or use of, or otherwise in connection with, the Website and / or Application. DR Mobility does not warrant that this site; information, Content, materials, product (including software) or services included on or otherwise made available to you through the Website; their servers; or electronic communication sent from us are free of viruses or other harmful components. 3. You will be required to enter a valid phone number and valid postal address with nearest landmark while booking for the services on the Website and / or Application. By registering your phone number with us, you consent to be contacted by us via phone calls and/or SMS notifications, in case of any services or delivery related updates. We will not use your personal information to initiate any promotional phone calls or SMS. 2. The information, recommendations and/or Services provided to you on or through the Website / Application are for general information purposes only and do not constitute advice. DR Mobility will take reasonable steps to keep the Website / Application and its contents correct and up to date but does not guarantee that the contents of the Website / Application are free of errors, defects, malware and viruses or that the Website / Application are correct, up to date and accurate. 3. DR Mobility shall not be liable for any damages resulting from the use of, or inability to use, the Website / Application, including damages caused by malware, viruses or any incorrectness or incompleteness of the information on the Website/Application. 4. DR Mobility shall further not be liable for damages resulting from the use of, or the inability to use, electronic means of communication with the Website/Application/call center, including but not limited to damages resulting from failure or delay in delivery of electronic communications, interception or manipulation of electronic communications by third parties or by computer programs used for electronic communications and transmission of viruses. 5. Without prejudice to the foregoing, and insofar as allowed under mandatory applicable law, DR Mobility's aggregate liability shall in no event exceed the equivalent of the amount for the payment of the Services. 6. The quality of the Services requested through the use of the Application is entirely the responsibility of the Driver who ultimately provides such transportation services to you. DR Mobility under no circumstance accepts liability in connection with and/or arising from the Services provided by the Driver or any acts, actions, behaviour, conduct, and/or negligence on the part of the Driver. 7. In the event we have a reasonable belief that there exists an abuse of vouchers and/or discount codes or suspect an instance of fraud, we may cause the User to be blocked immediately and reserve the right to refuse future Service. Additionally, should there exist an abuse of vouchers or discount codes, DR Mobility reserves the right to seek compensation from any and all such Users. 8. Offers are subject to DR Mobility's discretion and may be withdrawn at any time and without notice. 9. DR Mobility shall not be held liable for any failure or delay in performing Services where such failure arises as a result of any act or omission, which is outside our reasonable control such as unprecedented circumstances, overwhelming and unpreventable events caused directly and exclusively by forces of nature that can be neither anticipated, nor controlled, nor prevented by the exercise of prudence, diligence, and care, including but not limited to: war, riot, civil commotion; compliance with any law or governmental order, rule, regulation or direction and acts of third parties, strike / unrest ( "Force Majeure" ). 10. DR Mobility does not procure insurance for, nor is responsible for, damage or loss of any personal belongings or intellectual property whilst providing the Services. You release and indemnify DR Mobility and/or any of its officers and representatives from any cost, damage, liability or other consequence due to any of the actions of the Users of the Website and / or Application and specifically waive any claims that you may have in this behalf under any applicable law. 1. DR Mobility is the sole owner or lawful licensee of all the rights to the Website / Application and its content. Website / Application content means its design, layout, text, images, graphics, sound, video etc. The Website / Application content embodies trade secrets and intellectual property rights protected under worldwide copyright and other laws. All title, ownership and intellectual property rights in the Website / Application and its content shall remain with DR Mobility. 2. All rights, not otherwise claimed under this Agreement or in the Website / Application, are hereby reserved. The information contained in this Website / Application is intended, solely to provide general information for the personal use of the reader, who accepts full responsibility for its use. 3. You may access the Website / Application, avail of the features, facilities and Services for your personal or internal requirements only. You are not entitled to duplicate, distribute, create derivative works of, display, or commercially exploit the Website / Application Content, features or facilities, directly or indirectly, without our prior written permission of DR Mobility. 4. DR Mobility reserves the right to collect User data including name, contact information and other details to facilitate Services or use of its platform to avail Services. All information collected from the User is on a bona fide basis. Misuse and misrepresentation of identity or contact details will lead to automatic termination of Services or the use of the platform, without prior notice to such Users. 5. User accounts bearing contact number and email IDs are created and owned by DR Mobility. Any promotional discounts and offers accumulated can be revoked without prior notice in the event of suspicious account activity or mala fide intent of the User. 6. In the case where the system is unable to establish unique identity of a User against a valid mobile number or e-mail ID, the account shall be indefinitely suspended. DR Mobility reserves the full discretion to suspend a User's account in the above event and does not have the liability to share any account information whatsoever. 1. All content on this Website / Application is the copyright of DR Mobility except the third party content and link to third party website on our Website / Application, if any. 2. Systematic retrieval of DR Mobility content to create or compile, directly or indirectly, a collection, compilation, database or directory (whether through robots, spiders, automatic devices or manual processes) without written permission from DR Mobility is prohibited. User shall comply with all the applicable laws (including without limitation regulations as may be issued by Reserve Bank of India from time to time, Information and Technology Act, 2000 as amended by the Information Technology (Amendment) Act 2008, Prevention of Money Laundering Act, 2002 and the rules made there under, Income Tax Act, 1961) applicable to them respectively for using Payment Facility and Website and / or Application. Any information provided through this Website / Application is gathered by DR Mobility Solutions Pvt. Ltd. and the same is stored and controlled by DR Mobility Solutions Pvt. Ltd.
We collect and store information provided by you, for providing you a safe, efficient, smooth and customized experience. This allows us to provide services and features that most likely meet your needs, and to customize our Website / Application to make your experience faster, safer and easier. Also, the information we learn from you helps us personalise and continually improve your experience on the website / application. We use your information to assist the drivers in handling your request and for processing payments, communicate with you about the services and promotional offers that might be of interest to you. We also use this information to improve our platform, prevent or detect fraud or abuses of our website / application and enable third parties to carry out technical, logistical or other functions on our behalf. We use data collection devices such as "cookies" on certain pages of the Website/ Application to help analyse our web page flow, measure promotional effectiveness, and promote trust and safety. "Cookies" are small files placed on your hard drive that assist us in providing our services. We offer certain features that are only available through the use of a "cookie". We collect personally identifiable information (email address, name, phone number, credit card / debit card / other payment instrument details, etc.) from you when you set up a free account with us. While you can browse some sections of our Website without being a registered member, certain activities (using our services) do require registration. We do use your contact information to send you offers based on your previous use of services and your interest. Information You Give Us: We receive and store any information you enter on our website / application / provide on call or give us in any other way. You can choose not to provide certain information but then you might not be able to take advantage of many of our features. We use the information that you provide for such purposes as responding to your requests, customising future services for you, improving our platform, and communicating with you. Automatic Information: We receive and store certain types of information whenever you interact with us. For example, like many websites, we use "cookies" and we obtain certain types of information when your Web browser accesses the Website / Application or advertisements and other content served by or on behalf of the Website / Application or on other Web sites. E-mail Communications: To help us make e-mails more useful and interesting, we often receive a confirmation when you open e-mail from the Website/ application if your computer/ mobile device supports such capabilities. We also compare our customer list to lists received from other companies in an effort to avoid sending unnecessary messages to our customers. By using or continuing to use the site you agree to our use of your information (including sensitive personal information) in accordance with this Privacy Notice, as may be amended from time to time by Drivify in its discretion. You also agree and consent to us collecting, storing, processing, transferring and sharing information (including sensitive personal information) related to you with third parties or service providers for the purposes as set out in this Privacy Notice. We may be required to share the aforesaid information with government authorities and agencies for the purposes of verification of identity or for prevention, detection, investigation including cyber incidents, prosecution and punishment of offences. You agree and consent for Drivify to disclose your information, if so required under the applicable law. 3. Does Drivify share the Information it receives? Information about our customers is an important part of our business and we are not in the business of selling it to others. Drivify shares customer information only as described below and that are either subject to this Privacy Notice or follow practices at least as protective as those described in this Privacy Notice. Our Website & our mobile applications have stringent security measures in place to protect the loss, misuse, and alteration of the information under our control. Whenever you change or access your account information, we offer the use of a secure server. Once your information is in our possession we adhere to strict security guidelines, protecting it against unauthorized access. We may use third-party advertising companies to serve ads when you visit our Website or our mobile applications. These companies may use information (not including your name, address, email address, or telephone number) about your visits to this and other websites or applications in order to provide advertisements about goods and services of interest to you. 1. You can always choose not to provide information, even though it might be needed to use our service or to take advantage of such Drivify features as Your Profile, Wish Lists, Customer Reviews. 3. If you do not want us to use personal information that we gather to personalise advertisements we display to you, please adjust your Advertising Preferences. 7. Are Children Allowed to Use Drivify? Use of Drivify is available only to persons who can form a legally binding contract under the Indian Contract Act, 1872. If you are a minor i.e. under the age of 18 years, you may use Drivify only with the involvement of a parent or guardian. If you have any concern about privacy or grievances at Drivify, please contact us with a thorough description and we will try to resolve the issue for you. Use coupon code 'FLAT50' before booking the driver on the app. The 50% cashback amount is subject to maximum of ₹ 150 per transaction. The cashback can be availed a maximum of 3 times by a single user during the promotion period. Offer valid on booking through the Drivify app only. Use coupon code 'My1st' before booking the driver on the app. Offer Valid For 1st time users only. Offer valid on successful rides only.